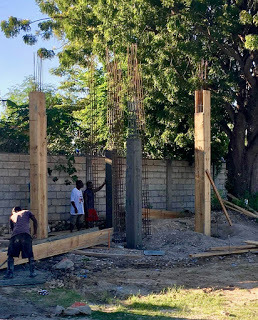 Editor’s Note: The hospital in Haiti is one of the eight projects featured as part of Global Strategy’s year-end impactX2 giving campaign. 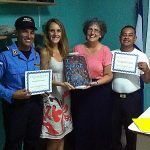 This post originally appeared on Mark and Kathy Fulton’s blog at http://haitifultons.blogspot.com/2018/11/such-simple-thing-water.html. Posted and edited with permission. I could not and cannot argue that point. Since the days of opening as a small clinic in 2005, the Hôpital L’Eglise de Dieu Réformée has been blessed by missionary Phyllis Newby’s generous spirit and her sharing of the water provided by the one well on the property. As the demands for water increased with the growth of the hospital, it has become necessary to regulate the water flowing from that well to the hospital so that Miss Phyllis will have an adequate supply for the more than 60 people living under her auspices. 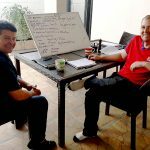 After several weeks of prayerful searching for a qualified well-driller, we identified one and signed a contract. Drilling began again in mid-September. 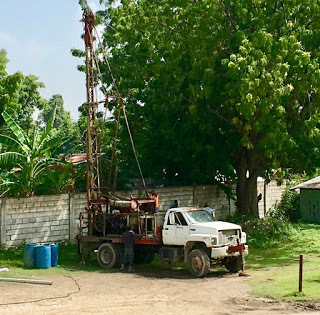 After a few weeks of digging and multiple broken parts, the Haitian well-drilling team stated that they were not sure that water was available where they were digging and they felt that abandoning the site would be better. Within a few days, they and their equipment were gone. We were unsure of if and when they might return. Hearing of this, I contacted Nicky Runk again, and with his God-given determination and prayer, he agreed to return to try to find water again in November. 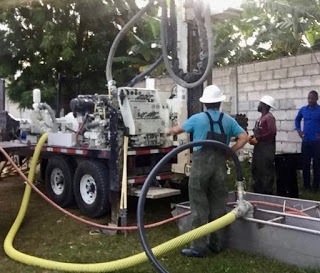 After a long two weeks, the Haitian company returned with another well drilling rig, borrowed from another company. The man in charge said they would try one more time. They began again. After finally passing through the nearly impenetrable shelf of rock and surpassing 200 feet in depth, the group still had doubts of finding water. Prayers were lifted in the Saintard community, in the US, and by friends in so many places, but water was still not found. Last Sunday, at around noon, I received a phone call from the hospital. I never thought those words would be so exciting! I wish I could say I never had a doubt, but that would be lying. I wish I could say that I never had a moment of discouragement about this. But that too would be false. I wish I had more faith. I can only say that I trust my Father in heaven and I never stopped praying for His will. I am thankful that His will included some water for our little hospital. As we begin construction of a water tower, within a few weeks, we should have a good supply of water at the hospital. Until then, when I arrive at the hospital and I hear, “We are out of water!”, I know that it is temporary and I smile. To learn more about the ministry of the hospital in Haiti or to contribute to its ministry, click here. To read other posts in this impactX2 series, click here.